Kroger had a sale on White Lily flours last week. 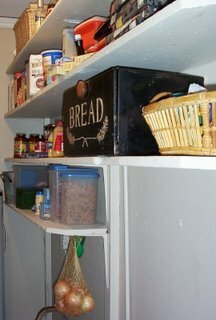 When I lugged home 50 pounds' worth, I knew I could no longer put off organizing the pantry. (I needed so much flour for the upcoming muffin breakfast.) I've never had more than a regular cabinet for food storage. The most I can say about this space is that it has potential, and I have yet to maximize it! Right now the pantry and I have a working relationship. I have several yard-sale Tupperware canisters left to fill, bags that need hanging hooks, and cleaning supplies in search of a logical home on the opposite side. I am oh, so envious of your pantry space. I have adapted a space in my garage and it works, but having one handier to the kitchen.... ah. How do you keep 50 lbs of flour fresh? I always freeze my extra to prevent weevils, but I don't think I could freeze 50lbs worth! Good luck with the pantry. You will figure it out! Wow! I should let hubby read this entry. He balked at the 5 pounds I'll be getting from Ingles tomorrow. Well, the sacks are 5 lbs apiece, so ten sacks--varied between bread, all-purpose, and cornmeal flours--isn't TOO crazy! Goslyn, I anticipate using the bulk of this flour before Christmas, so I'm not as concerned about weevils. I have heard that you can freeze a few sacks at a time for two days apiece then transfer to an airproof container like a commercial food grade bucket with lid. The short period of freezing is enough to kill existing weevils.